Where Northwest ingredients meet internationally-inspired cooking. Lunch daily, Dinner Tues.-Sat., Brunch Sat.-Sun. 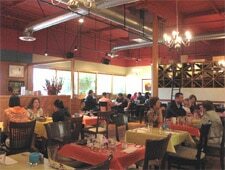 : Pomegranate Bistro’s seasonal menu offers twists and riffs on classic comfort food. Lisa Dupar is behind the restaurant, and she’s known for her catering expertise and innovative food-focused enterprises. The menu pairs Northwest ingredients with international flavors: year-round favorites include lamb sliders with feta, harissa mayo and fennel-apple slaw on a caraway bun; roasted Brussels sprouts paired with chèvre; and hot smoked salmon with pickled shallots and fried capers. A bakery just inside the main entrance offers breads and pastries to eat in or take out, while the espresso bar serves organic roast espressos. Meanwhile, a sleek bar framed with sparkling bottles on the south side of the place serves inventive cocktails and maintains the extensive wine list.